My Creepy Wood crafts one-of-a-kind, handcrafted furniture and decor in Santa Clarita. Master woodworker Terry Hollinger applies her expertise to craft unique wooden pieces. Typical pieces from Hollinger include bird houses, furniture like chairs and benches, gnome homes, decor, coat hangers and other original concepts. Hollinger’s pieces can add a little bit of magic and charm to any backyard, entryway, or any part of your Santa Clarita home that needs a little sparkle. New pieces are consistently rotated into the catalog as they are crafted by Hollinger, so keep an eye on the store page to make sure you secure your dream piece. Hollinger’s woodshop is a magical place where dead and creepy wood find a beautiful and bright new life. Bring some of the beauty and positive energy that a piece from Hollinger brings into your home with your own piece from this unique artist. 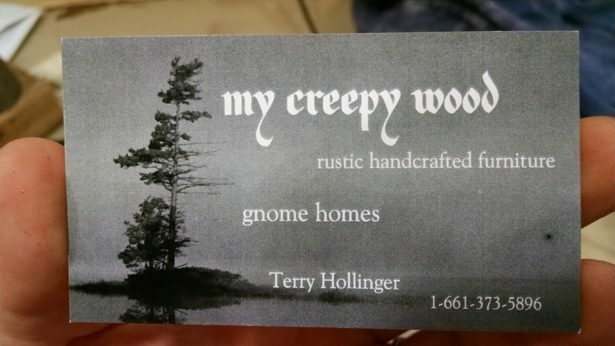 For more information about My Creepy Wood, click here.